Abstract. The 2017 Mw 7.3 Iran–Iraq earthquake occurred in a region where the pattern of major plate convergence is well constrained, but limited information is available on the seismogenic structures. Geological observations, interpretation of seismic reflection profiles, and well data are used in this paper to build a regional, balanced cross section that provides a comprehensive picture of the geometry and dimensional parameters of active faults in the hypocentral area. Our results indicate (i) the coexistence of thin- and thick-skinned thrusting, (ii) the reactivation of inherited structures, and (iii) the occurrence of weak units promoting heterogeneous deformation within the palaeo-Cenozoic sedimentary cover and partial decoupling from the underlying basement. According to our study, the main shock of the November 2017 seismic sequence is located within the basement, along the low-angle Mountain Front Fault. Aftershocks unzipped the up-dip portion of the same fault. This merges with a detachment level located at the base of the Paleozoic succession, to form a crustal-scale fault-bend anticline. Size and geometry of the Mountain Front Fault are consistent with a down-dip rupture width of 30km, which is required for an Mw 7.3 earthquake. How to cite: Tavani, S., Parente, M., Puzone, F., Corradetti, A., Gharabeigli, G., Valinejad, M., Morsalnejad, D., and Mazzoli, S.: The seismogenic fault system of the 2017 Mw 7.3 Iran–Iraq earthquake: constraints from surface and subsurface data, cross-section balancing, and restoration, Solid Earth, 9, 821-831, https://doi.org/10.5194/se-9-821-2018, 2018. A balanced cross section across the hypocentre of the 2017 Iran–Iraq Mw 7.3 earthquake is presented. The structural style of the area is characterised by inversion tectonics with partial decoupling between the basement and the 10 km thick sedimentary cover. The main shock is located along a low-dipping lateral ramp of the Mountain Front Fault. 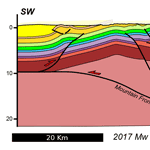 The balanced cross section indicates that the Mountain Front Fault is the only fault where an Mw 7.3 earthquake may occur.